For those who love geology trips, the Cabo de Gata Natural Park is one of the many geology paradises in the Province of Almeria. One may find cherry-red almandine garnets which lie in a drystream bed near Nijar or explore 'EL Hoyazo', which was a volcanic emission on the sea bed and its cone is made of a very unusual rock called "shoshonite". From cream-coloured fossiliferous limestones, containing corals and shells, to greenish-grey deposits of bentonite and small calderas in Rodalquilar that even brought gold to the surface in pipes of pinkish, low dendisty, aluminiumrich alunite. The gold was mined until the 60s, and the crushing plant and settling basins can still be visited. Hi, my name is David Monge. I graduated in 2002 with a BS in Geosciences from University of Huelva, SW Spain and have been a geologist ever since. 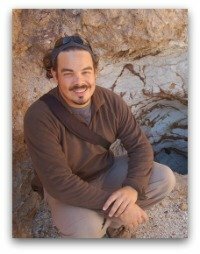 For almost 2 years, I was a researcher in the Department of Geology of the University of Huelva related to environmental and atmospheric pollution matters, and after that I worked at the regional office for environmental issues in Seville. In 2006 I left the public sector and began working for an Italian engineering company dealing with preventive and corrective interventions on foundations of buildings. There I acted as the National Technical and Marketing Manager. I’ve always been passionate about outdoors, education and divulgation as a vocational worker. So in 2008 I had the idea to develop a new project which finally became reality in 2011. geoGata, was born. Looking for a different way of visiting Almeria and Andalusia? There are lots of tourism services that guide you through the region, but there isn’t any service designed for you to discover it by yourself. geoGata is the first next-generation tourism experience. Only one day? 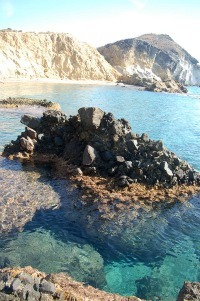 The 'Mystery of Almandine', The Language of the Rocks, or the Volcanic Basin Coastal Path can be some of your choices. Have a weekend? Great! Come and join us on the Regional Tectonics Field Tour. Want to spend an entire week? If you’re crazy enough to try to become a geologist in a week, we’re crazy enough to teach you. Let us design one of our geology trips for you to discover the formation of the betic cordillera and its associated sedimentary basin fillings and neotectonics. geoGata is the only Active Tourism and Geotourism company in the SE Spain created, led and managed by a geologist. No one but geoGata can meet your expectation for science tourism in the region. But there’s more. We collaborate with other companies specialized in cultural, environmental and historic tours, so please do not hesitate to ask us if you want to have a break from the rocks! Moreover it’s our philosophy: we are nature lovers, we live in the Cabo de Gata Natural Park, we want to see sustainable development of the territory and the people living on it, and we are 100% committed to its preservation. That’s because not only our jobs depend on it, also our lives are linked to the protected areas. As well as the respect of our environment, geoGata’s way of thinking is to keep you smiling and learning all the time, enjoying all aspects of your vacation in Spain. We want you to come again next year! You do not have to be a Geology Geek ... become one! Take your kids to an Open Class-Room lesson about Earthquakes, Volcanoes.. while enjoying breathtaking landscapes at Cabo de Gata! Join David from GeoGata on a Day Trip. Awesome! Perfect activity for kids, better than boring school lessons! Here are the forthcoming activities scheduled by GeoGata. Price: 20Euros per person, and if you ara a fan of the Geo Gata Facebook Page, there will be 5 € discount! geoGata is an Officially Registered Active Tourism Guide Company No. AT/AL/00069. Feel free to directly contact David Monge by means of the following email form.